Carpet Cleaners in the suburb of Wahroonga & surrounding areas. We clean for your health like no one else with faster drying times, deep penetrating methods and a focus on green certified solutions which are kids, pet and eviromentally safe. ​Chem-Dry Clean & Fresh Carpet Cleaning Services Wahroonga is a leading Chem-Dry franchisee from the North-West region that is committed to giving you the best possible cleaning results along with a friendly & honest service. Fully trained and insured we care about your carpets and fabrics using only the best equipment and environmentally friendly solutions. This means you receive 100% Green & Eco-Friendly PH Neutral carpet cleaning. Fast drying times will ensure a Drier, Cleaner, Healthier home unlike steam cleaners who blast your carpets pushing dirt deep within the pile adding excess water and harsh toxic soaps. Your carpets will stay cleaner for much longer. 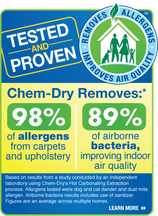 So.....WHY CHOOSE CHEM DRY CLEAN & FRESH - for best carpet cleaning results? Experience the "Difference' and see why Chem-Dry is the preferred carpet cleaning company in the Sydney, Wahroonga area. Vacuum your carpets at least once a week using a vacuum cleaner with a HEPA filter. Remove stains and spills as promptly as possible. Remove as much excess as possible, then apply and blot with a clean white cloth. DO NOT rub the spot as this might grind the stain in further. ​Does a family member in your home suffer from allergies? Do you have children who love to play on the carpet? Carpets absorb and collect common allergens and germs that can spread illness, cause allergies and make asthma symptoms worse for you and your family. Chem-Dry Clean & Fresh can reduce tough odours and allergens, leaving your carpets clean and healthy. \When adding sanitiser to our 'Deep Cleaning' Hot Carbonation Extraction Carpet Cleaning process, we removed an average of 89% of the bacteria in the air and 82.3% of the bacteria from carpets.